Big schools of fish; healthy corals; ripping currents; warm, crystal clear blue water and large and diverse shark populations. That’s what makes Fakarava such an exceptional place to dive. The French Polynesian atoll has been an UNESCO biosphere reserve since 2006. Two main passes feed into the 400+ square mile lagoon. The first is the Garuae Pass, located on the north side. The second is the Tetamanu or Tumakohua Pass, located 33 miles to the south. The strong tidal exchange between the ocean and the lagoon concentrates the fish in the passes, which have proliferated considerably in the absence of commercial fishing. The result is a healthy reef dominated by corals, algae eaters and predators that generate welcome tourist dollars for the 800+ locals that inhabit Fakarava. A true biosphere reserve success! I spent a week diving French Polynesia with my friends of Unique Dive Expeditions. Our quest was to photograph the grouper spawning in Fakarava South Pass. Every year in June or July, several days before the full moon, close to 20,000 marbled groupers (Epinephelus polyphekadion) leave their solitary lifestyle in the lagoon and gather to spawn in the mouth of the pass. Huge spawning aggregation of marbled groupers (Epinephelus polyphekadion) in Fakarava South Pass (Tetamanu Pass), French Polynesia. From the surface the reef looks normal down at 90 feet but as you descend, an awesome scene unfolds. Every square foot of bottom is covered in marbled groupers. The view is even more impressive during slack tides when the fish lift off the bottom towering up to 6 feet into the water column. As the full moon approaches, the energy of the groupers increases. Males vie for spawning rights as the females begin to hydrate. High densities of prey attracts lots of predators. At 900+ sharks, Fakarva South has one of the densest shark populations in the world. How do so many sharks find enough food? Researchers believe that they feed on the grouper, surgeonfish and parrotfish aggregations in the channel (Mourier, 2016). A good reason to protect these spawning aggregations as well the sharks. Sharks rest during the day and feed at night when the prey is resting. The sharks in Fakarva have an awesome feeding startegy. They hunt in packs to flush out fish hiding in the reef. When a fish moves, they use electroreception and night vision to catch it. What ensues is feeding frenzy like no other – dozens of sharks bulldozing through the water column wrestling for the prize. The frantic sharks are surprisingly coordinated throughout the hunt and showed no interest in us, even though we were virtually inside the pack at times. Marbled groupers (Epinephelus polyphekadion) spawning in Fakarava South Pass (Tetamanu Pass), French Polynesia. In the early hours of the morning on the day of the full moon all hell breaks loose. The current is ripping out to sea and conditions are optimal for offspring survival. Everywhere I look, groups of groupers are shooting up high into the water column releasing their gametes. Predators rush in to feed on the distracted fish and the eggs. The spawning fireworks last until the current switches. Within a few hours, not a single grouper remains on the site. The spent fish have made their way back into the lagoon – until next year. Camouflage groupers (Epinephelus polyphekadion) aggregate in Fakarava South Pass (Tetamanu Pass), French Polynesia. Camouflage groupers (Epinephelus polyphekadion) race up into the water column to spawn in Fakarava South Pass (Tetamanu Pass), French Polynesia.. The fish intially rise as pairs releasing gametes but other males quickly rush to join in. 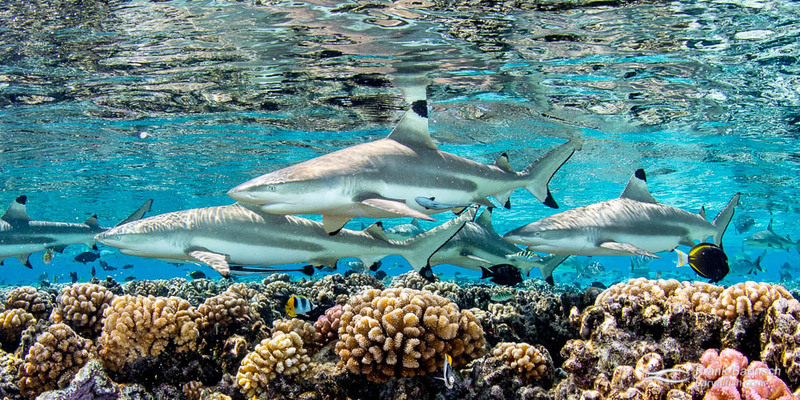 Mourier J, Maynard J, Parravicini V, Ballesta L, Clua E, Domeier ML, Planes S (2016) Extreme Inverted Trophic Pyramid of Reef Sharks Supported by Spawning Groupers. Current Biology 26(15): 2011-2016.